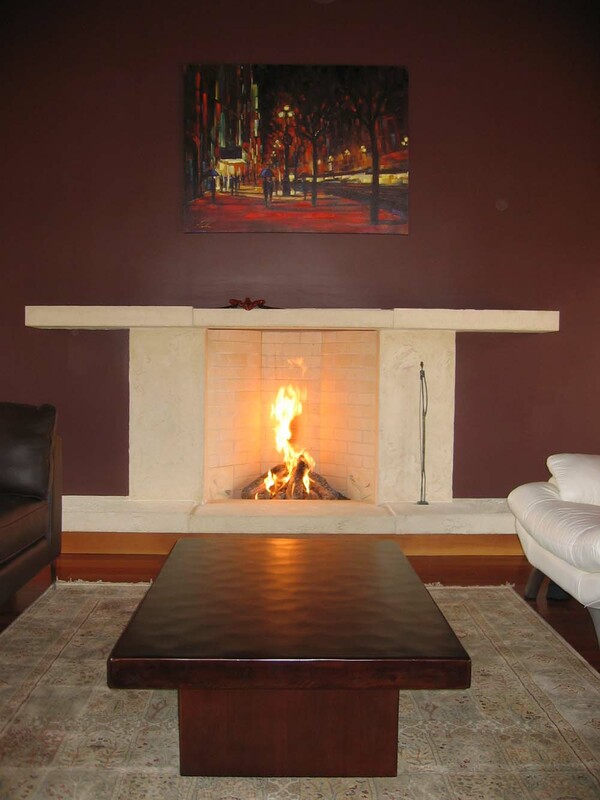 Here are pictures of our 36" Rumford fireplace. I designed the mantel, hearth and pedestals. The 2x2 slots you see are for an ever-changing exhibit of decorative tile inserts, photographs, colored sand, seashells, whatever! Thanks for all your advice and feedback. The mason was Vinko Saric, from the South Bay Area. Thank you. Great design and great pictures. I added it to our picture gallery at http://www.rumford.com/Buch.html with a link to you. I like the fireplace. Do you like it? Is this fireplace in your own home? Did you get approval to build and "certified" wood-burning Rumford or have you installed a gas log? I designed the fireplace and the house - every little detail. I love it. It is my finest work. Indeed, this is our own home. We installed gas logs, but it has been approved for both gas logs and wood burning. The wood burning aspect was harder to get approved, as you know, but we did eventually.